One of my favourite parts of cooking and food is entertaining, both everyday entertaining and for special occasions! That's why I was so delighted to be sent a copy of the new Food For Family & Friends edited by Julia Charles. A book filled not only with great food and drink recipes suitable for entertaining but also tips and tricks on placing, matching wines and many more. I even showed it to my son home from University and he thought that it would be great for students, with plenty of recipes to cook and share with friends- he's already asked for a few to take back with him! The book is filled with lovely pictures to accompany each recipe, many of which are full or half-page. I also particularly liked the introductions for each recipe, which include helpful ideas on both selecting and sourcing ingredients and how to include dishes in menus when entertaining. I thought that the brunch, nibbles and sharing plates recipes were particularly versatile, many would make great lunches! There is an interesting section on cheeseboards, paring different cheeses with the seasons, and accompanying wine ideas. Every page has lovely bright photos! I decided to make the garlic mushrooms and goats' cheese on sourdough toast from the brunch section of the book as a late lunch. They were really easy and quick, and I thought they would also make a great starter! You want to use a soft, mild goats' cheese for this recipe, alternatively you could use ricotta. Instead of the sourdough, I used toasted ciabatta and swapped the tarragon for fresh rosemary. Clean the mushrooms and put them onto a roasting tray lined with foil. In a small bowl, mix the crushed garlic and the olive oil, then dribble it over the mushrooms. Season with salt and pepper to taste. Roast for 8 minutes. After 8 minutes, sprinkle over the pine nuts and balsamic vinegar, also the fresh rosemary leaves if using instead of the tarragon. Bake for another 8 minutes or so. Just before the mushrooms are ready, toast the bread and spread with the goats' cheese. 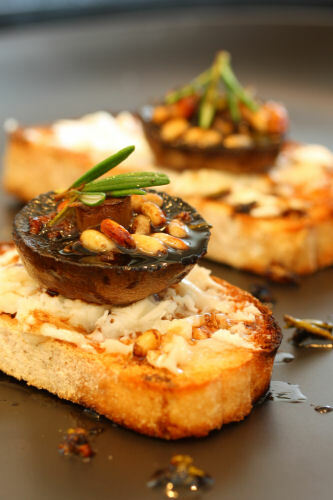 Arrange the mushrooms, pine nuts and rosemary on top, or if using fresh tarragon, scatter it over the top. Add more seasoning if needed and serve immediately. It has be be said that Ryland Peters do do lovely looking books! I think they are one of my favourite publishers. 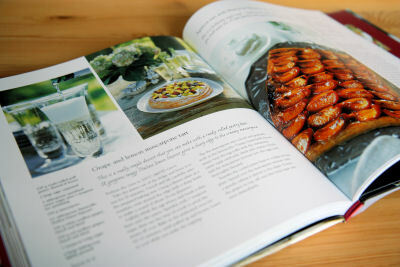 Beautiful photos and recipe and the book also looks right up my street Nic! Looks and sounds delicious. My whole family love mushroom and these sound particularly delicious. Thanks for sharing. I think I definitely need that book...and a slice of these gorgeous toasts...I am now very hungry indeed! a new recip for me.. But lovely clicks!!!! What a fancy dish this makes. Love all the combinations of flavors here! 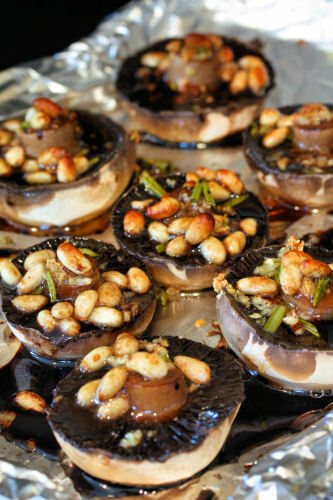 Those mushrooms look so delicous, I love pine nuts and goats cheese so the whole thing sounds amazing! I love mushrooms and goat cheese together! Such a wonderful combo! Wow! Love this recipe - the book looks amazing. Great photos as always Nic! 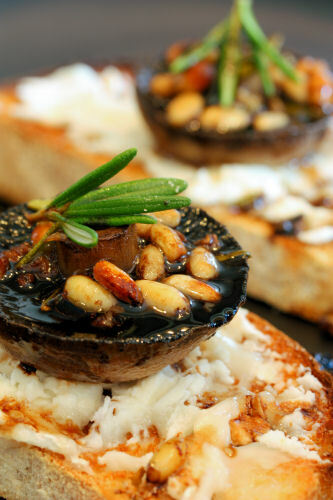 Am slowly converting to goats cheese, though I adore mushrooms - the dish looks so tasty can almost taste it! This sounds like a fantastic book! 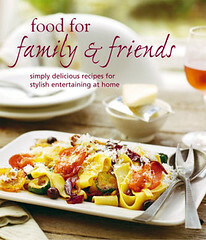 I know many groups of friends that do mini "come-dine-with-me" evenings and this book would be great help. You definitely chose a great recipe to try out - I could murder a few of those mushrooms on toast! oh my, those mushrooms look sooooooo good. The mushrooms look picture perfect. I love these Ryland, Peters and Small books. I think this recipe is fab! Love how pine nuts are used with this, AND also goats cheese. Bookmarked. I was served this as my starter for Christmas dins by my brother, and everyone thought it was yummy!